I'd agree. I don't think it's a hit take but a logical evolution. They need to go further I think. Upturn the conventions by making it an open air game like BotW. Heck, Nintendo should let them use the BotW technology to build it. I mean, I think Dragon Quest 11 is a good blueprint for any Turn Based RPG. Yup, DQ XI & Xenoblade 2 were the games I imagined when thinking of an evolution for pokemon franchise in terms of the actual game world & exploration. And if they don't want to make it Square can always make another DQ Jokers. It's too slow for a Pokémon post game. It would make an "epic" campaign, but it would make breeding, catching, training a chore. To be fair all those things are already a chore. From a gameplay perspective, I still think that random encounters suit Pokemon games better than wild Pokemon appearing in the overworld. Wandering around aimlessly doing nothing while waiting for the right enemy to spawn in DQ games is WAY more boring than constantly triggering random encounters until the right Pokemon appears. But I agree for the rest. A Draconian Quest equivalent for Pokemon would be a godsend. They need to go even further imo. It's the perfect template for a 3D Zelda actually. I'd love it if Nintendo took a look at DQ11 and tried to make a similar Zelda game. Not if there's a "catch pokemon" strategy option that takes care of weakening the pokemon and throwing the ball at the right time. And if all your carried pokemon receive exp. That's not a hot take. 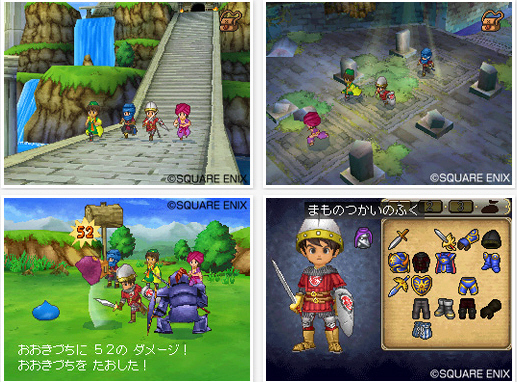 Pokemon started life as a Dragon Quest 5 immitator. Why stop now? I wouldn't mind a Pokémon with Toriyama art characters and DQ XI styled world. This is not at all a hot take, Pokemon is heavily inspired by Dragon Quest. You are totally right OP, that would be a good direction for the series to take. Can't say I disagree. Hell, I even thought DQIX was the perfect template for Pokemon DS. And I agree, but since the campaigns arent fun either due to the lack of dificulty and GF trying to go for a "cinematic" campaign making the games slower. Since I only care about the MP and you sadly need to spend too much time on breeding, I care more about not making that part of the game even slower. Doesn't have to be all of it. But now that you mention it, I've wanted to see a Zelda RPG for a long time. ...I never knew I wanted this. A lot of JRPGs would benefit from learning from DQ11. Absolutely. Haven't played Dragon Quest XI, but from videos ect. I really hope we get an evolved Pokemon, I'm honestly shocked that they keep reusing the same formula since the Gameboy. They have the money. Full animations and full voice acting should be a standard. This as well... they have the ability and the potential! While playing through it I thought a lot about how I’d want a Pokemon game like that. They would just need to open up a suite of options and post game content after completion of the main story/campaign that would specifically cater to typical post game activities. No, No No Kino is the best Pokémon game of all time. Fact. Sure, I'd take it as a first step. Literally anything other than Pokemon Sun/Moon HD. I never thought I wanted this. Now I'm sad because it will never happen. Yes I agree so much. I'm almost done with DQXI and I really was thinking "man if only Pokemon had towns like this." The bold are legit the biggest changes that need more focus in the next gen of PKMN to be stay interesting to me in the future. I need more customization options for my hero, and shoot even my monsters. They should all be able to wear hats. Moving in battle would add to the immersion, and bring it closer to parity w/ the anime I loved when I was a kid. And after Let's Go, I'd be straight washed if they added random battles back in after making them more streamlined. I'm interested to see what the project shapes up to be int he end though. And as someone above stated if it can start to crest to something like the Dragon Quest Monsters games, I think that would be cool. Played a lot of Joker back in the day and remember liking that a bunch. You make a lot of valid points OP. Don't really want to fight you on that. A lot of RPGs should follow the DQ11 template, but if there's one thing I'd change it would be to make the world map seamless a la DQ8 instead of segmented into areas. Is there any specific reason why Gamefreak wouldn't go all out for Pokemon Switch and make it a big 3D RPG? Or something at least similar to the GameCube games? Only thing holding them back before was the power of the handhelds right? Right? Too bad it's gonna look more like the 3DS version of XI. So you mean a new DQ Monsters. I think a single player Pokemon game with the gameplay of Ni No Kuni: Wrath of the White Witch would be great. When is breeding not a chore? Pokemon wish it's as good as 3DS version of DQXI. You do realize that Game Freak owns a sizeable chunk of the IP, right? They have very interesting "philosophies" when it comes to what players want. I mean Dragon Quest Monsters already exists so yeah that's not really a hot take. Given TPCi & NoA’s respective track records regarding voice acting, be careful what you wish for.